The European rollout focuses on the six-wheel drive 622GP and 672GP models that feature fuel efficient Final Tier 4 John Deere diesel engines (6.8L and 9.0L), boasting 227 (169kW) and 255 (190kW) horsepower respectively. "We are excited to leverage our relationship with the Wirtgen Group to introduce John Deere construction equipment to a new market, further expanding our global footprint," said David Thorne, senior vice president, sales & marketing, Worldwide Construction & Forestry. "Wirtgen's stellar reputation for supporting customers, and large distribution network, allows us to serve these new markets well offering them powerful motor grader solutions in two priority countries." The introduction is a result of increased interest in John Deere earthmoving equipment following the Wirtgen Group acquisition in 2017. Understanding motor graders are heavily used in roadbuilding applications, the synergies between the Deere models and the Wirtgen portfolio, as well as the thriving French and German markets were determining factors in bringing the machines to the continent. The European rollout focuses on the six-wheel drive 622GP and 672GP models that feature fuel-efficient Tier 4 Final John Deere diesel engines (6.8L and 9.0L), boasting 227 (169 kW) and 255 (190 kW) horsepower respectively. Six-wheel drive with automatic differential lock, allows the machines to power through the toughest cuts and gives operators increased traction in poor ground conditions or when working on ditches or side hills. The 622GP with 12-foot (3.66-metre) moldboard operates at a weight of 42,060 pounds (19,078 kg), while the 672GP with 14-foot (4.27-metre) moldboard weighs in at 44,040 pounds (19,976 kg). Other key features of the Grade Pro (GP) models include comfortable dual joystick controls with lever steer and standard steering wheel; automatic return-to-straight, high-resolution reverse camera; rear mounted ripper/scarifier; front dozer blade; 18 light LED package; and Automation Suite that helps operators improve daily production by reducing the number of controls needed to perform common tasks, including auto-articulation, blade flip and operator-selectable machine presets. John Deere motor graders include an "open-architecture" design, letting customers employ any of their favorite brand of grade-control systems. John Deere motor graders include an open-architecture design, letting customers employ any of their favorite brand of grade-control systems. GP models come factory equipped with bulkhead connectors, sensor mounts, electrical wiring harnesses, integrated controls, and moldboard mast mounts. All GP models also come standard equipped with automated cross-slope. Cross-slope simplifies holding a consistent slope by allowing operators to run a single control while the machine automatically adjusts the opposite side of the blade. Customers will appreciate the ground-level fuelling, and ease of service with daily service points grouped on the left side of the machine. Maintenance personnel will appreciate the easy-access filter bank and cooling package, which eliminates stacked coolers and swing out fan door. A standard reversing hydraulic fan runs only as fast as necessary to keep things cool, conserving power and fuel, while reducing noise. 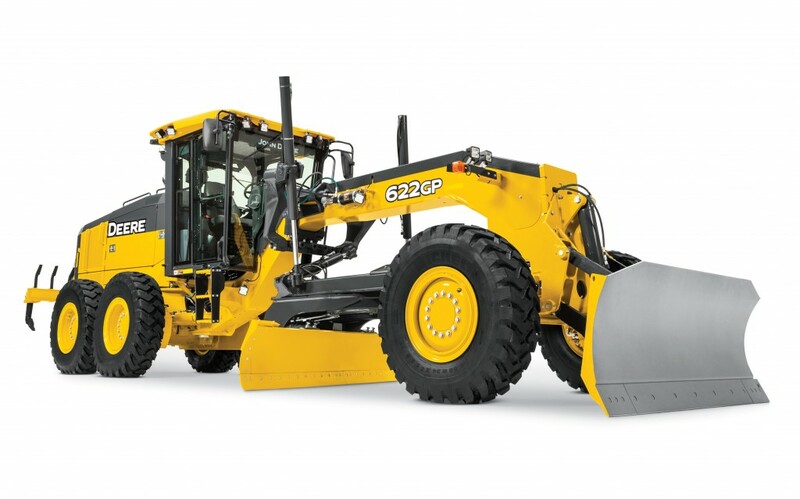 The two models will be on display at bauma 2019.